Businesses pay for water three times: when they buy it from the water utility company, when it is discharged as waste effluent, plus a standing charge for both services. A 20% VAT charge is normally added. This toolkit is designed to help organisations improve water efficiency, minimise risks and reduce costs. Review current water usage and costs as presented on utility bills, including any abstraction licence fees and effluent discharge costs and any charges for discharge to controlled waters. Include any additional waste disposal costs from tanker transport, treatment and disposal. This will provide a useful basis for determining whether future actions to reduce water consumption and waste effluent are likely to generate cost savings or deliver a reasonable return on investments. As a general rule, water and effluent bills can be reduced by around 30% at little or no cost to those businesses that have not previously tried to save water. A site survey helps identify where water is distributed and discharged, which is useful for identifying possible water saving opportunities and where there are potential risks — for example, identifying storm drains located close to storage bunds. Your topic Discharge to Sewer explains issues related to pollution and trade effluent discharge consents. The topic Discharge to Water explains issues related to pollution of natural water courses and the regulations designed to protect marine life. where sewers and storm drains discharge wastewater from the site. Tracking underground pipework may not always be possible, but locating water entry and exit points can usually be identified. Compile a site plan to support any future action plan. A water use survey helps understand how, where and when water is used on site and how it is discharged. Write notes and make sketches of where water meters are located and describe those activities, processes and operations that use water. Useful tip — explain to colleagues what you are doing and ask for views on current water uses and where savings might be made. This is valuable in engaging others in the process and highlighting early opportunities for water savings. Locate your meters — most commercial and industrial site have at least one mains water meter and may have other sub meters to record water usage at specific locations on site. A typical water meter records usage in cubic meters which is displayed in digital or analogue form on the meter. Read the meter — record the data in graphic format to identify water usage trends over time. This can help identify excessive use in a particular product or operation, and where there may be opportunities for water savings. There may also be seasonal variations which can also be managed better. Useful tip — continue to read the meter during site maintenance or during shut down. If the meter continues to record water usage there may be a leak in the distribution pipes, which is adding unnecessary costs to utility bills. A water balance management tool measures water entering the site, water consumed on site (eg activities and products) and water leaving the site as effluent (eg wastewater). The flow or use of water through a system may include, for example, factory operations (including products), cafeteria (food preparation and dish washers), toilets (including wash basins and showers). Knowing the water balance can help a business manage water and effluent more efficiently by identifying opportunities for water savings, preventing leaks and reducing evaporation. 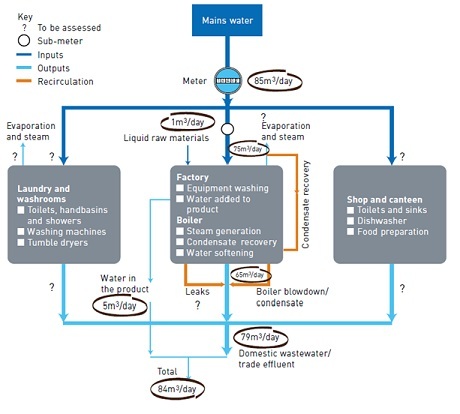 After taking meter readings and completing the mass balance flow chart, identify activities and processes likely to use the most water and measure flow rates — as shown in the above diagram. Also, identify major sources of effluent and consider other possible water losses. Croner-i Water Management System provides more details on how mass balance works in practice. Useful tip — in the example above, the water input (85m3/day), is more than the water output (84m3/day). This is not unusual and indicates losses in the system which may be through evaporation (in this case, steam evaporation) or leaks and spillages. There may be other losses, depending on the types of operations and the management of on-site activities. A key benefit of the mass balance approach is to identify potential opportunities for reducing water usage in the system. Is it necessary to use water for the process/activity or is there a cost-effective alternative? How can I reduce water? Could I use lower quality water? Can I recover and reuse water anywhere? Is the use [of water] authorised and legal? Is it necessary to produce this wastewater/effluent? Is clean water going down the drain and, if so, why? Is the discharge authorised and legal? Can the wastewater/effluent be reused on a process or used for lower grade duties, eg cleaning? Would it be cost-effective to treat the wastewater/effluent on-site for reuse? See also our Hot and Cold Water Services Industrial Water Audit Form, plus Guidance Notes. Reviewing the data may reveal opportunities for reducing water usage which in turn will minimise effluent discharges. effluent pumping, treatment and discharge. wastewater discharges — clean water discharged to sewers (increasing volume and cost), unauthorised surface discharges to sewers (eg leaking bunds). Write down all the areas identified where there may be water savings opportunities. Calculate how much water is being used and where — as outlined in the water mass balance above. Estimate how much water a particular water saving device might save and the costs saved — include the cost of purchasing the devices. Designate someone to do the work and a timeline for completion. For more comprehensive management action plans that cover several actions, see Water Management System. This uses a similar format to the management system prescribed in ISO 14001: Environmental Management Systems..
soft water trigger-operated nozzle for pot washing and hosepipes. These measures are designed to reduce consumption and effluent discharges. The Government's Water Technology List (WTL) promotes products that encourage sustainable water use and rewards businesses for investing in them through the Enhanced Capital Allowance (ECA) scheme. A manufacturer makes high-quality packaging at its site in Bradford. As part of its waste minimisation campaign, the company reviewed water use and found that printers regularly left print cylinders to clean under running taps. Once identified, this habit was quickly corrected. A water mass balance at a toiletries manufacturing site identified an unknown water use of 500m3/year. A site tour identified a tap that had been left running and some leaking pipework. The tap was turned off and pipework mended by the in-house maintenance department, resulting in water savings worth £15,000/year. A family brewery achieved savings of over £32,500/year by monitoring water flows through the brewery and ensuring actual consumption was as close as possible to theoretical consumption. Payback was effectively instantaneous. An electroplating company reduced its water consumption by nearly 60,000m3/year, saving almost £45,000/year. Good housekeeping, use of flow monitors and some flow restrictors reduced water use significantly without any major modifications. The payback period was six months. A processor of woven fabrics discovered that water was being used within non-production hours during a review of water at its dyeing and finishing works. Monitoring consumption identified the source — a faulty ball valve was causing the boiler hotwell tank to overflow to drain. A new ball valve (£30) was fitted, resulting in savings of £1650/year. An electroplating company based in the West Midlands uses mains water to rinse components. Due to variations in water pressure, the inlets to the plating lines were set to maximum flow, giving a consumption of around 390m3/day. Fitting flow restrictors to the inlet of each tank reduced water consumption to 226m3/day, representing a saving of over £36,000/year. A company manufactures jam at its Merseyside site. The washing of vessels, pipework and pumps between batches uses around 10m3 of water daily. During cleaning, product is discharged to drain; this has a high chemical oxygen demand (COD), resulting in high trade effluent charges. Fitting a new pigging system to the pipework reduced effluent costs by £104,000/year and product loss by £134,780/year. These savings represent a payback period of around four weeks.